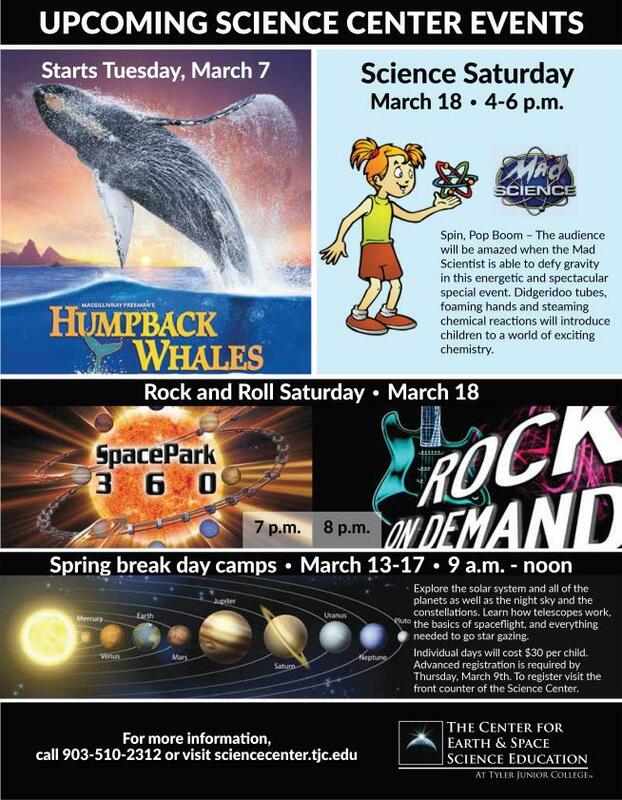 Don't miss our upcoming spring break events that include a new planetarium show, Rock and Roll Saturday, spring break camps, and more! Even though school may be out during spring break, there are still plenty of things to do and even more to learn at TJC's Science Center. We have a brand new planetarium show debuting on Friday, March 10th. Take an extraordinary journey into the hidden world of nature's most awe-inspiring marine mammal. Humpback Whales takes you to Alaska, Hawaii, and the Kingdom of Tonga for a close-up look at how these whales communicate, sing, feed, play, and care for their young. Captured with IMAX® cameras, and found in every ocean on Earth, humpbacks were nearly driven to extinction 50 years ago, but today are making a steady recovery. Join a team of researchers as they unlock the secrets of the humpback and find out why humpbacks are the most acrobatic of all whales, why they sing their haunting songs, and why these intelligent 55-foot, 50-ton animals migrate up to 10,000 miles round-trip every year. Spring break day camps are back and better than ever starting Monday, March 13th! And there is still space left for each day for more campers! Join us as we explore the night sky, the solar system, the galaxy and beyond. Every day of camp will have a different focus ranging from spaceflight to telescopes to constellations and more. Children can attend any number of days for only $30 per child per day. Advanced registration is required. For more information, call the Science Center at 903-510-2312. To register, visit the front counter at the Science Center. We are also happy to announce we are hosting another Family Science Saturday on Saturday, March 18th. Kids can participate in multiple hands-on activities and enjoy interactive demonstrations by the Mad Scientists. For more information on any of our upcoming events feel free to check out our website or give us a call at 903-510-2312!